Since the start of the recovery, many real estate investors have been duking it out in so-called gateway markets, driving up prices as they have competed to acquire trophy office towers. Highwoods Properties Inc. (NYSE: HIW) has been absent from the feeding frenzy in America’s largest cities. Ed Fritsch, president and chief executive officer, says the office REIT has no interest in elbowing its way into New York, Los Angeles, Chicago or other high-profile markets. Instead, Highwoods continues to strengthen its hand in mid-tier markets, which have begun to enjoy increased investor interest as yields in gateway cities have declined. The company owns a 31-million-square-foot portfolio comprised largely of office properties, most of them located in the Southeast. Highwoods is the largest office landlord in Raleigh, N.C., where it was founded in 1978 by a group of local entrepreneurs who came together to develop an office park on a 122-acre site. The company – which went public in 1994 and grew rapidly over the next several years through mergers and acquisitions – is still headquartered on the site of that office park, Highwoods Office Center. Among REITs, Highwoods is the largest owner of office space in nearly a dozen mid-tier cities, stretching from Tampa, Fla., to Richmond, Va. In late 2011, it entered the Mid-Atlantic region with its $214 million acquisition of PPG Place in Pittsburgh’s resurgent central business district. Highwoods acquired the iconic Class-A office complex for less than half of its estimated replacement cost at a time when Pittsburgh wasn’t on the radar of many other investors. The deal was a classic example of Highwoods’ “hit ‘em where they ain’t” strategy, says Michael Knott, managing director at Green Street Advisors. In 2012, Highwoods expanded its footprint in Pittsburgh with its $99 million acquisition of EQT Plaza, a 32-story, Class-A office tower also located downtown. “We find some real benefit to being in mid-tier markets,” says Fritsch, who joined the company in 1982 and served in numerous positions before succeeding former CEO and co-founder Ronald Gibson in mid-2004. “In order to be successful, it is essential that we be in the deal flow of a particular market. Being a big dog on a medium-sized porch is the key to being in the deal flow,” adds Fritsch, 55. Highwoods’ approach and its dominance in certain faster-growing Sun Belt locales have helped to make it a darling among investors in the office REIT sector. In the past five years, the company’s stock has been one of the best-performing in the sector. It gained nearly 32 percent on a cumulative total-return basis for the five-year period ending in the third quarter of last year, while the FTSE NAREIT Equity Office index rose by almost 15 percent. 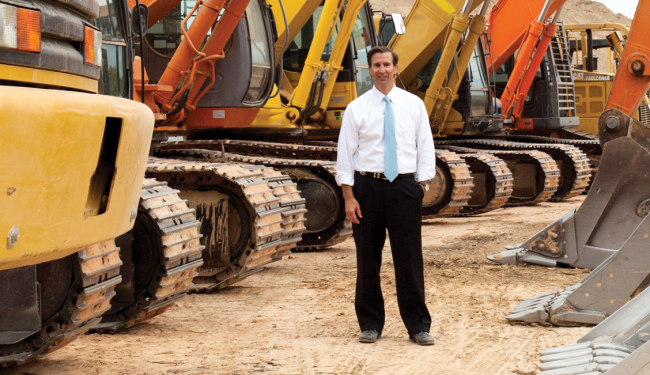 To be sure, the company has come a long way since Fritsch took the reins in the midst of an office-sector slump that hit the Southeast particularly hard. At the time, Highwoods had one of the lowest office-portfolio occupancy rates among major REITs in the sector. Highwoods’ turnaround began with some serious corporate soul searching in 2004. Just after taking the helm, Fritsch worked closely with the company’s directors and his newly appointed management team to reassess virtually every aspect of the business, from its balance sheet and head count to its compensation structure for in-house brokers. “Ed was committed to getting the ship turned around and everything was on the table in terms of changes, whether it was personnel or processes,” Knott says. Among other things, the plan called for a sharper focus on owning “the better assets in the best business districts,” informally known within the company as BBDs. Fritsch says Highwoods coined the term “better business districts” in an effort to convey its commitment to owning top-notch office properties in submarkets, whether urban or suburban, that hold up well during tough economic times and rebound quickly during recoveries. Between early 2005 and late 2007, Highwoods took advantage of a robust acquisitions market to sell about $741 million worth of non-core office and flex industrial properties and $96 million worth of land. The company exited Charlotte and Columbia, S.C., as a result of its dispositions. Prior to rolling out its strategic plan, Highwoods “had a lot of commodity-type office buildings, which worked out fine when the economy was good and vacancy rates in any given market were low. But when things turned down, Ed realized that these assets were going to be the first to have high vacancy rates, plus they typically require a lot of capital expenditures to stay competitive,” says Brendan C. Maiorana, an analyst with Wells Fargo Securities. The timing of Highwoods’ strategic plan was certainly fortuitous. “In the years leading up to the credit crisis, Highwoods focused on improving its balance sheet and its competitive position, and it didn’t get out over its skis with development. The company was in repair mode going into the downturn, and that worked to its advantage,” Knott says. In recent years, Highwoods has capitalized on growing investor demand to continue to shed non-core assets, including its entire industrial portfolio in Atlanta. In all, the company has sold more than $1.4 billion worth of buildings, at an average capitalization rate of 7 percent, and $113 million worth of land since early 2005. It has used the proceeds to fund acquisitions and development and to reduce its leverage (including preferred stock) to 42 percent of gross asset value as of late last year, down from 51 percent in early 2005. Its fortified balance sheet has allowed the company to take advantage of lingering distress in the office market to buy trophy office properties with leasing upside, often at a discount to their replacement cost. In 2011, Highwoods stepped up its acquisitions activity and has since purchased about $1.2 billion worth of properties, at a first-year average GAAP capitalization rate of nearly 8 percent, according to the company. The repositioning of its portfolio, along with rebounding fundamentals in the sector, has contributed to a much-improved occupancy rate. In the third quarter of last year, Highwoods’ portfolio occupancy rate was 90 percent, up from 85 percent in early 2005. Today, about 92 percent of the company’s annual rental revenues are generated by office properties, versus 85 percent in early 2005. Highwoods’ portfolio also includes 2.7 million square feet of industrial space and nearly 1 million square feet of retail space – comprised of shops within and adjacent to its office buildings and one shopping center, Country Club Plaza in Kansas City, Mo. Highwoods came to own Country Club Plaza, an upscale, open-air lifestyle center spanning 15 blocks, through its 1998 acquisition of J.C. Nichols Co. Some of Highwoods’ property acquisitions in recent years expanded its footprint in rebounding suburban markets, such as Atlanta’s affluent Buckhead district. Others have given the company, long pigeonholed as a suburban office REIT, a larger presence in downtown markets. Last September, for instance, Highwoods acquired a 29-story, LEED Gold, Class-A office tower in the central business district of Nashville, Tenn., where the occupancy rate for Class-A office space surpassed 93 percent earlier in the year. With its $153 million acquisition of The Pinnacle at Symphony Place, located near the Country Music Hall of Fame and other major attractions, Highwoods grew its Nashville portfolio to more than 3 million square feet. In Pittsburgh, Highwoods was able to buy PPG Place for less than half of its estimated replacement cost partly because there was little competition for such assets in late 2011 and the property’s occupancy rate languished at 81 percent. The six-building complex has since seen its occupancy level grow to more than 93 percent, as of late last year. Despite the highly publicized woes of Detroit, Pittsburgh and many other mid-tier American cities have undergone an economic and cultural renaissance in the past decade thanks to significant public and private sector investment, Fritsch explains. Pittsburgh, he adds, is home to a diverse group of nine Fortune 500 companies and a large and thriving collection of universities and hospitals. Although it has a foothold in the Mid-Atlantic region, Highwoods remains bullish about its prospects in the Southeast, parts of which have seen some of the fastest levels of job growth in the country. The region, according to Fritsch, has become a magnet for companies relocating from other parts of the United States in search of lower operating costs and an abundance of well-trained workers. Many parts of the Southeast are also enjoying strong population growth due to a migration of people from other regions seeking better job prospects, more affordable housing and a good quality of life, Fritsch adds. Raleigh, N.C., for instance, saw its population grow by more than 3 percent during the past decade, which was three times the rate of growth of the U.S. population, according to Highwoods. Over the next five years, Raleigh’s population is expected to grow by more than 2 percent, which is more than twice the estimated rate of growth for the country, according to Highwoods. The influx of companies to the Southeast has given rise to development opportunities for Highwoods. In Cary, N.C., for instance, the company is developing 427,000 square feet of office space for MetLife’s new global technology and operations hub. The $110 million project, which will initially house about 1,200 MetLife employees, is entirely pre-leased by MetLife. Carey is one of the largest municipalities in the fast-growing Research Triangle. “The continued rate of population growth in the Southeast and the migration of companies to the region will help those who do business there, whether they sell cars or mattresses or lease office space,” Fritsch says. Despite its many positive attributes, the Southeast also has been prone to overbuilding in the past, according to some analysts. During the current recovery, however, the office sector generally hasn’t seen much in the way of development, particularly of the speculative sort. Low levels of new supply have helped to push up occupancy rates for existing properties, putting pressure on rents despite the slow pace of economic growth. During the third quarter of last year, Highwoods leased 1.7 million square feet of office space, its highest volume since the first quarter of 2005, and net effective rents on second-generation office leases hit a record high for the company. “Highwoods is benefitting from a dual tailwind” of improving fundamentals in a number of its markets and low levels of development, says David Rodgers, a senior analyst at Robert W. Baird & Co.
Rodgers and other analysts are keeping a close watch on the supply outlook, particularly now that investment capital has begun to flow more freely to secondary markets. “The worry going forward is that the supply picture is changing as we speak,” Knott says. “In the office market, the supply picture is generally becoming a little bit less of a silve r lining every day,” he added. For its part, Highwoods, Fritsch says, is heavily focused on development in infill locations, where new supply tends to be constrained by a dearth of sites and other factors. The company has a $276 million pipeline of projects, which were 87 percent pre-leased as of late last year. Fritsch says he is confident that development activity in the sector will remain at low levels because banks are still reluctant to lend, which puts many private developers at a disadvantage. What’s more, the cost of construction has been stubbornly high due to the elevated price of petroleum-based building materials, he said. “All of this suggests that our balance sheet will enable us to be in the catbird seat to respond to requests for proposals and with regard to leasing second-generation space,” Fritsch adds. Nearly 10 years after the rollout of its strategic plan, Highwoods has established no “finish line” when it comes to the plan, says Fritsch. The company, which has a total enterprise value of $5.4 billion, will continually seek opportunities to strengthen its portfolio, internal processes and balance sheet, he explains. It’s not hard to see why Fritsch – whose congenial, straight-forward style has been a good fit for Highwoods – is sticking by the plan. Since 2005, the company has reduced its head count by 24 percent and its building count by 40 percent. Yet, its annual revenues have climbed by 19 percent and its net operating income by 29 percent on an annualized basis. On a cumulative total-returns basis, Highwoods’ stock has outperformed the major U.S. stock market indices, gaining more than 124 percent between early 2005 and last October.